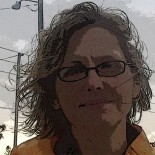 Dawn Abeita writes fiction in Atlanta, Ga. Her work explores how quirks of personality and everyday evils impact people’s lives. She has been a fellow at the MacDowell Colony and the Vermont Studio Center, and earned her MFA from Warren Wilson College. Contact Dawn at dawnabeita@gmail.com.